PL 2973 p.452, ‘The Royall & Most Pleasant Game of y Goose’. This Royal Game of the Goose, pictured above, is what we would today call a ‘board game’. It is pasted into an album of prints collected by Samuel Pepys which he called My Collection of Prints and Drawings..Relating to the Citys of London and Westminster and Their Environs, put together in 1700. At the rear of the album there are various ephemeral items, such as this game, invitations, playing cards and trade cards . The Royal Game of the Goose is known to date back over five hundred years; it is mentioned in a 15th century Italian sermon as something which should not be played at Christmas time, should it cause a distraction. The earliest dated example of the game is from 1598, Il nuovo et piacevole gioco dell ocha by Lucchino Gargano of Rome, and it is known that Francesco de Medici, the Grand-Duke of Tuscany sent a Royal Game of the Goose to Philip II of Spain. The Pepys Library’s game dating from 1690 (though the date is not printed on the paper) is the earliest surviving English goose game. It bears a striking resemblance to the early Italian example, both in the rules of the game and appearance. This suggests that there was, as Adrain Seville says, ‘evidence of wider international diffusion of the game in Europe by the end of the 16th century.’ A picture of the Italian example can be found via this link. The English and Italian examples both have the jester figure at the start of the game and the drinking scene at the end. The game is played with two dice and counters. The game does not require any skill: it is a game purely of chance and following instruction, like Snakes and Ladders. The goose is a symbol of good luck and spiritual advancement – by landing on the spaces depicting geese, the player advances further in the game, by the same number of places the player has just thrown on the dice. There are also ‘hazard’ spaces, illustrated with symbols which hamper spiritual advancement, such as the prison (space number 19) or the inn (space number 52). Space number 58 with the skeleton is certainly to be avoided: if a player lands on this space, they must start at the beginning of the game again. In the game there are 63 spaces, which in the numerology of the Ancient Greeks and early modern period was symbolic: Each 7th and 9th year of a person’s life were believed to represent critical or ‘climacteric’ points, and so by multiplying these two numbers together, number 63 was known as the ‘Grand Climacteric’. It is known that Elizabeth I’s astrologers were concerned for her welfare in her 63rd year, for example. In the game, Seville suggests that 63 as the endpoint of the game represents ‘the evolution of a human life: once the Grand Climactic was passed, peace and wisdom were to be enjoyed’. The Royal Game of Goose is still played in modern formats in Europe, especially in the Netherlands. High-resolution prints of Pepys’s Royal Game of Goose are on sale in the Pepys Library for £2.50. Why not try the game out during the Christmas vacation period? Morrill, John Stephen. The Oxford Illustrated history of Tudor and Stuart Britain. Oxford: Oxford University Press, 1996. Seville, Adrian. 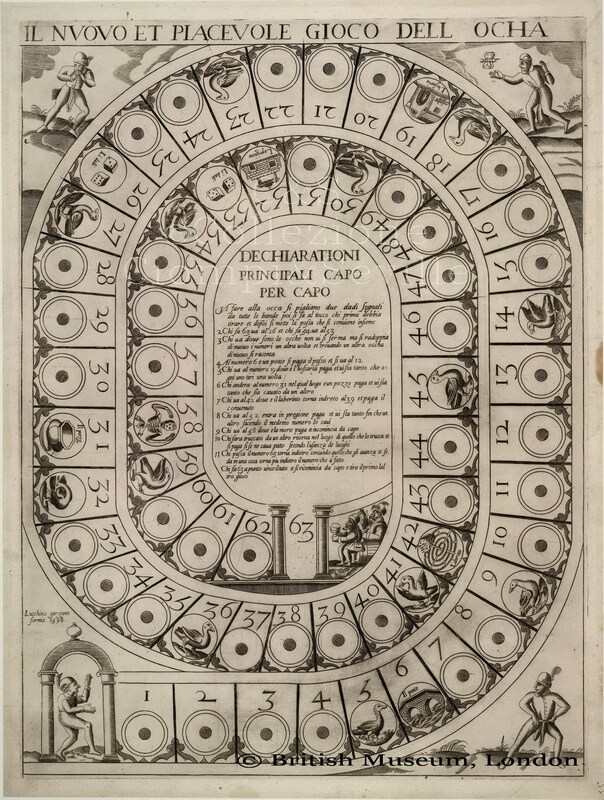 The Royal Game of the Goose : 400 Years of Printed Board Games. New York: Grolier Club, 2016.